Under the influence of an ancient telepathic field, Kira attempts a mutiny as Sisko and O'Brien grow militant. Dolamide? Really? How can somebody hear that and not think of Dolemite? This episode elaborates really well on Odo's detective skills and ability to manipulate people. 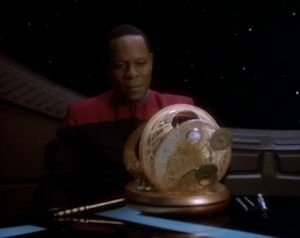 It starts before things go sideways, with the demonstration of how slyly he gets the information he needs from Quark, and when things get really crazy, it is up to him to figure out the puzzle and manipulate all the players into the cargo bay at the same time. I am almost 100% certain Quark was faking his neck injury. This is a fun episode that I'm sure the actors really enjoyed working on. It's a useful trick to take characters out of themselves in order to explore them out-of-context, and by forcing them to play out an extreme version of the Sisko/Kira political friction, it exorcizes a lot of the political issues on the station. It isn't exactly mind-blowing or original, but I do enjoy seeing Sisko as an aloof overlord, Kira as a power-hungry chess player, O'Brien as a virtual Nazi, and Dax as an absent-minded jester.